October 27, 2015 – A structural test article of the interim cryogenic propulsion stage (ICPS) for NASA’s new deep-space exploration rocket, the Space Launch System (SLS), has been completed at United Launch Alliance in Decatur, Alabama, prior to handover to the Boeing Company of Chicago. 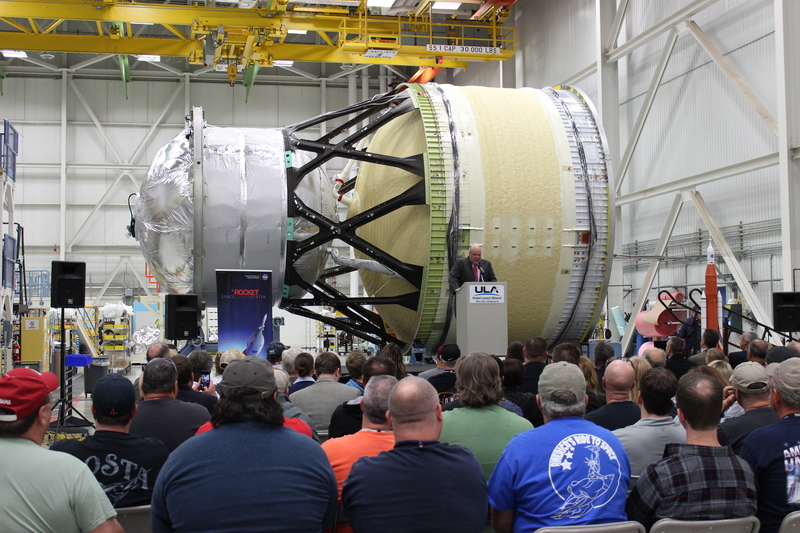 Boeing is the prime contractor for the SLS core stage. 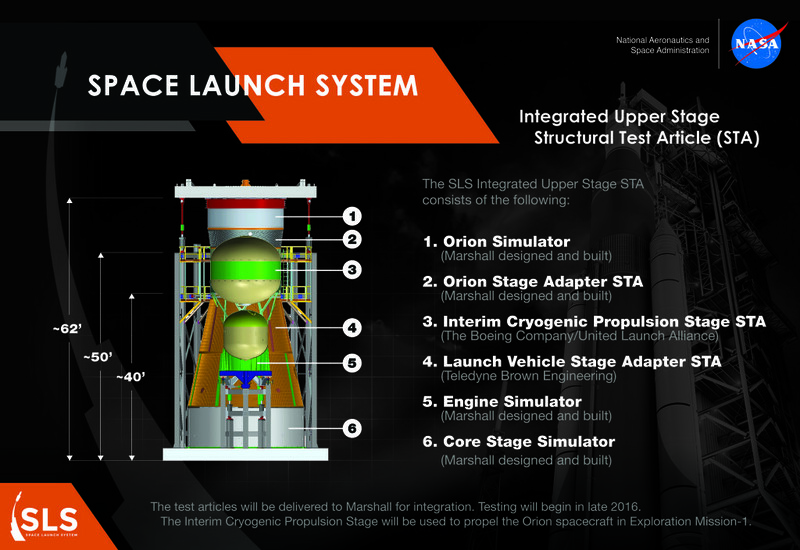 The first flight test of the SLS, called Exploration Mission-1, will feature a Block 1 configuration for a 70-metric-ton (77-ton) lift capability and carry an uncrewed Orion spacecraft beyond low-Earth orbit to test the performance of the integrated system. The ICPS is the liquid oxygen/liquid hydrogen-based system that will give Orion the big, in-space push needed on that mission to fly beyond the moon before it returns to Earth. The ICPS structural test article ultimately will move to NASA’s Marshall Space Flight Center in Huntsville, Alabama, where it will join other structural test articles and simulators that make up the upper portion of the rocket. Engineers will stack the structural test articles and move the 56-foot-tall structure to a test stand to verify the integrity of the hardware and ensure it can withstand the loads it may experience during flight. Orion spacecraft simulator – a replica of the bottom portion of the exploration vehicle that will carry the crew to space, provide emergency abort capability, sustain the crew during the space travel, and provide safe re-entry from deep space return velocities. Orion stage adapter — connects the Orion to the SLS’s ICPS. The adapter technology was used for Orion’s first test flight in December 2014. Core stage simulator — a duplicate of the top of the SLS core stage that is approximately 10 feet tall and 27 feet in diameter. The rocket’s entire core stage will tower more than 200 feet tall and house the vehicle’s avionics and flight computer. It also will store cryogenic liquid hydrogen and liquid oxygen that will feed the vehicle’s RS-25 engines. A structural test article for the launch vehicle stage adapter, which connects the core stage and the upper stage, is currently in production at Marshall. Modifications to the Delta Cryogenic Second Stage include lengthening the liquid hydrogen tank, adding hydrazine bottles for attitude control and making some minor avionics changes to meet the design parameters and performance characteristics as needed by NASA to meet the flight objectives. An Aerojet Rocketdyne RL-10B2 engine – also currently used on the Delta Cryogenic Second Stage – will power the ICPS. NASA continues to examine its timeline for evolving SLS toward the Block 1B configuration with a 105-metric-ton (115-ton) lift capability to enable more ambitious missions. As the SLS evolves, it will ultimately provide an unprecedented lift capability in its Block 2 version capable of lifting 130 metric tons (143 tons) to enable missions even farther into our solar system.